We drew on research showing that certain people have attentional biases toward socially threatening information, so they automatically focus on any sign of rejection or criticism from others, which in turn perpetuates their sensitivity to rejection and heightened tendency to experience social stress. asked call centre workers to play a very simple game for 5 minutes before they started work. The game involved finding, as quickly as possible, an image of a single smiling face in an array of 16 photos, the rest of which showed a frowning face. The team found that employees who had played the game produced 17 per cent less of the stress hormone cortisol after their shift than those who did not play the game. How does this translate to less stress? 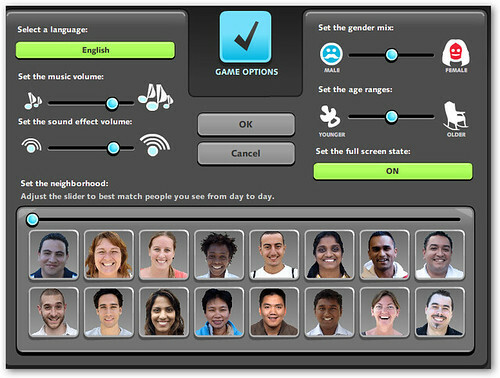 Researcher Michael Baldwin thinks that when you "dismiss" the frowning faces in the game, you "disengage" from stress. 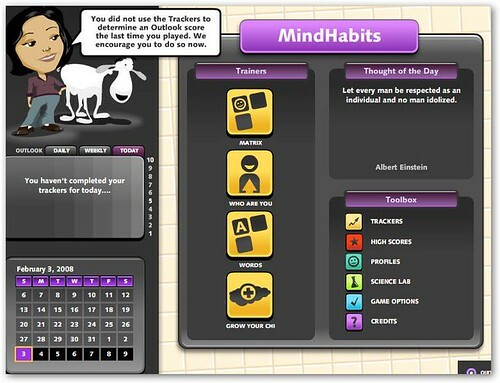 The Mind Habit game itself involves selecting words that positively reinforce your self-image ("Who Are You"), picking a smiling face out of a crowd of frowning ones ("Matrix"), and clicking on smiling faces in clouds ("Grow Your Chi") among other activities. You can play the demo here.